In this tour de force of the ultimate and extreme in astrophysics, renowned astrophysicist and author J. Craig Wheeler takes us on a breathtaking journey to supernovae, black holes, gamma-ray bursts and adventures in hyperspace. This is no far-fetched science fiction tale, but an enthusiastic exploration of ideas at the cutting edge of current astrophysics. Wheeler follows the tortuous life of a star from birth to evolution and death, and goes on to consider the complete collapse of a star into a black hole, worm-hole time machines, the possible birth of baby bubble universes, and the prospect of a revolutionary view of space and time in a ten-dimensional string theory. Along the way he offers evidence that suggests the Universe is accelerating and describes recent developments in understanding gamma-ray bursts--perhaps the most catastrophic cosmic events of all. 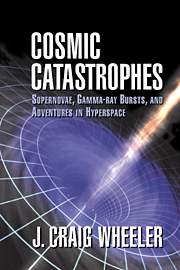 With the use of lucid analogies, simple language and crystal-clear cartoons, Cosmic Catastrophes makes accessible some of the most exciting and mind-bending objects and ideas in the Universe. J. Craig Wheeler is currently Samuel T. and Fern Yanagisawa Regents Professor of Astronomy at the University of Texas at Austin and Vice President of the American Astronomical Society as of 1999. 1. Setting the stage: star formation and hydrogen burning in single stars; 2. Stellar death; 3. Dancing with stars: binary stellar evolution; 4. Accretion disks: flat stars; 5. White dwarfs: quantum dots; 6. Supernovae: stellar catastrophes; 7. Supernova 1987a: lessons and enigmas; 8. Neutron stars - atoms with attitude; 9. Black holes in theory: into the abyss; 10. Black holes in fact; 11. Supernovae and the universe; 12. Black holes, worm holes and beyond.